At Providence College, the faculty, staff, and administration want you to make the most of your time here. We care deeply about you and your success, and have developed a set of foundational principles to prepare you well for life after graduation. We call them The Friar Four. Our Student Affairs programs and services are built on these four pillars, and we hope you will consider building on them as well. 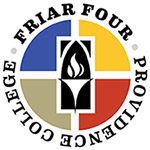 To see how some of our students describe their experience with The Friar Four, please view the video below.